After installation of new transverters for 23 and 13 cm with stabilized LOs a couple of months ago. I gathered some experience in using JT65C mode on EME. So I undertook a new attempt to receive and decode G8MBU via aircraft scatter today. As antenna I use a 3 m dish with a dual band ringfeed. The beacon is located at Cowes on the Isle of Wight, IO91IR37, 683 km from Mainz, JN49CV. It runs 2 W power into an omnidirectional dual alford slot antenna. 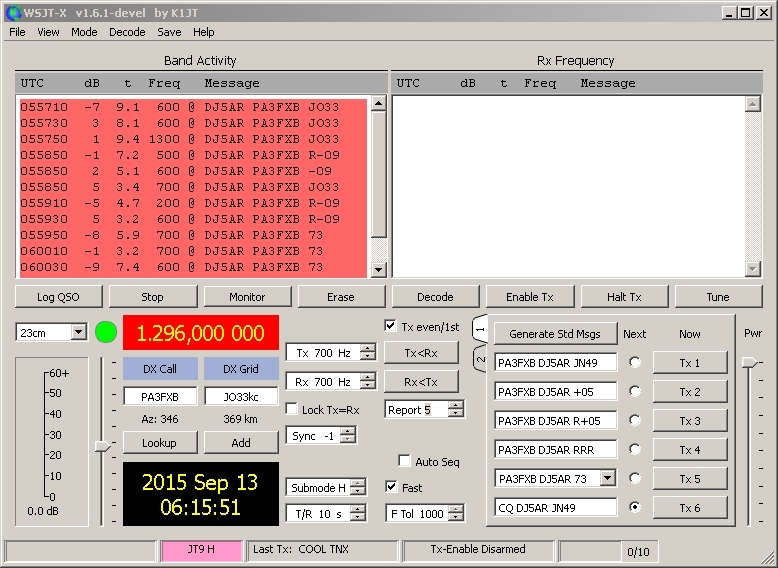 The mode used is JT65c. Nominal frequency is 1296.800 MHz. To successfully decode the signal, the SSB dial should be set to 1296.7986 MHz, to get a tuning tone of 1400 Hz in WSJT. In total I monitored G8MBU for 5 hours. The propagation conditions were normal today, no tropo at all. This entry was posted in Aircraft Scatter, Beacons, WSJT and tagged 1296 MHz, 23 cm, Aircraft scatter, AirScout, beacons, JT65C, WSJT on 2017-07-05 by admin. 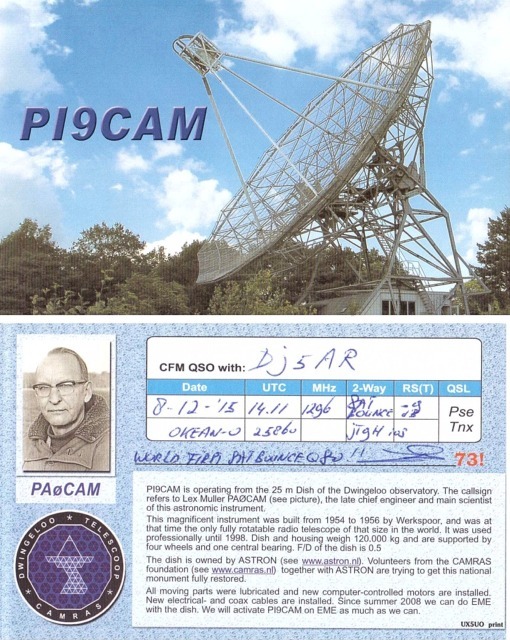 Today PI9CAM´s QSL for the first Satellite Bounce QSO via an unmanned spacecraft done by radio amateurs arrived by mail. As we know, there have been previous commercial attempts for Satellite Bounce in the early 60s using ECHO 1 and ECHO 2 which were inflated balloons with diameters of 30 and 41 m. The initial orbits were at heights of 1500 km and 1200 km. Enjoy the movie “The Big Bounce” about our predecessors 55 years ago! 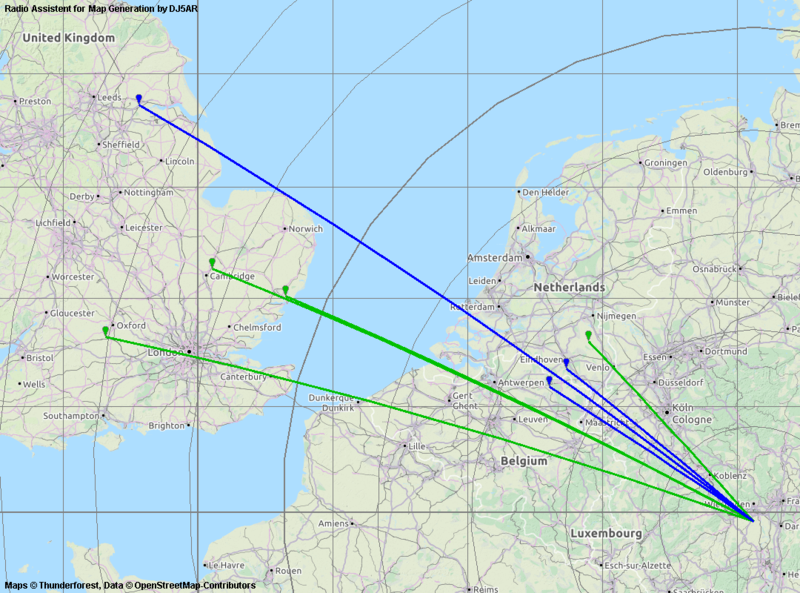 This entry was posted in ISS, ISS Bounce, WSJT and tagged 1296 MHz, 23 cm, Amateurfunk, DJ5AR, Dwingeloo, ECHO 1, Mainz, PA3FXB, Parabolspiegel, PI9CAM, Radiotelescope, Satellite Bounce on 2015-12-23 by admin. While ISS Bounce took Jan, PA3FXB, and me 2 months of testing and improving to succeed, Satellite Bounce was a much bigger challenge. Despite the fact, Jan and the team of PI9CAM are operating the 25 m dish of the Dwingeloo radio telescope, it took us nearly 2 years, enormous patience and scores of tests until we finally managed to receive “Rs” to complete a QSO today (December 8th, 2015). As far as we know, it is the first time ever, a two way amateur radio contact could be completed by using an unmanned spacecraft as a reflector.Above screenshot shows the position of the satellite at the end of the QSO. The Satellite rose in SSE and set in NNW. A calculative common window opened at the point, marked “O”. Local obstructions were not considered. Due to safety reasons transmissions in Dwingeloo are limited to elevations above 10°. So the AOS (acquisition of signal) happend shortly before the groundtrack of the Satellite crossed the 40th degree of latitude northwards, as soon as PI9CAM started transmissions. Sum of slant ranges (distance between ground station and satellite) was 3400 km at the beginning and 2000 km at the end of the contact. The used object OKEAN-O (NORAD #25860) is a joint Russian-Ukrainian Earth observation satellite, launched on July 17th, 1999 by an Ukrainian Zenit-2 carrier rocket. The satellite is in a polar orbit of about 650 km height with an inclination of 98°. The mass is 6.2 tons and the RCS (radar cross section) is figured between18 and 20 m². It has been used for research of natural resources, ecological monitoring and hazards prevention. Designed for a life time of 3 years, it is out of service now. In use by the ground stations were the 25 m radio telescope in Dwingeloo by PI9CAM with 120 W and a 3 m dish with 150 W at the feed by DJ5AR in Mainz. 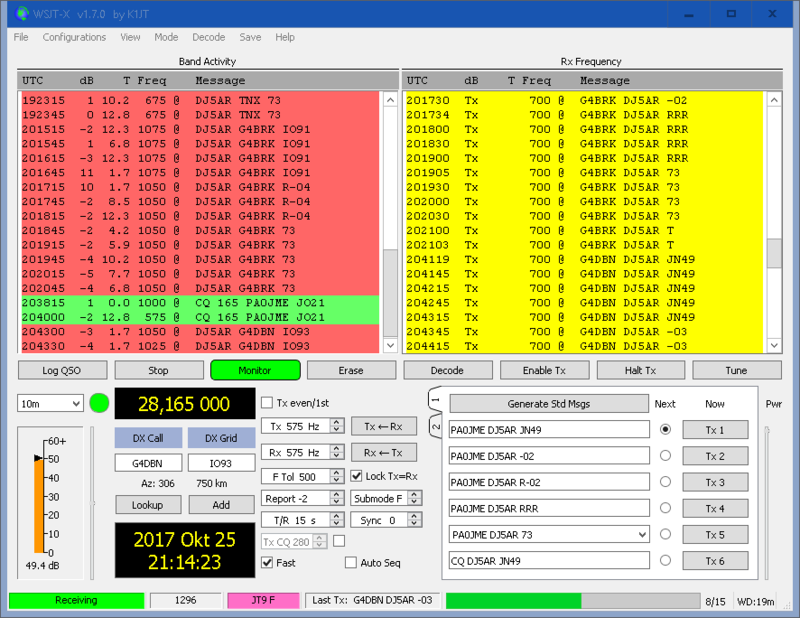 The mode used was digital JT9H that comes with the new WSJT-X software by Joe Taylor, K1JT. The transmit/receive periods were set to 10 seconds, working around a center frequency of 1296.300 MHz. The automated Doppler tracking (+/- 60 kHz) has been performed for the complete path on DJ5AR´s side with a homebrew tracking software. The calculative power budget during the QSO was about -154 dBm. This value is very optimistic, as it presumes the optimum reflectivity of the satellite, which depends on its orientation. Selection of suitable satellites, depending on radar cross sections and slant ranges. Compensation of the Doppler shift with a maximum rate of 600 Hz/second. 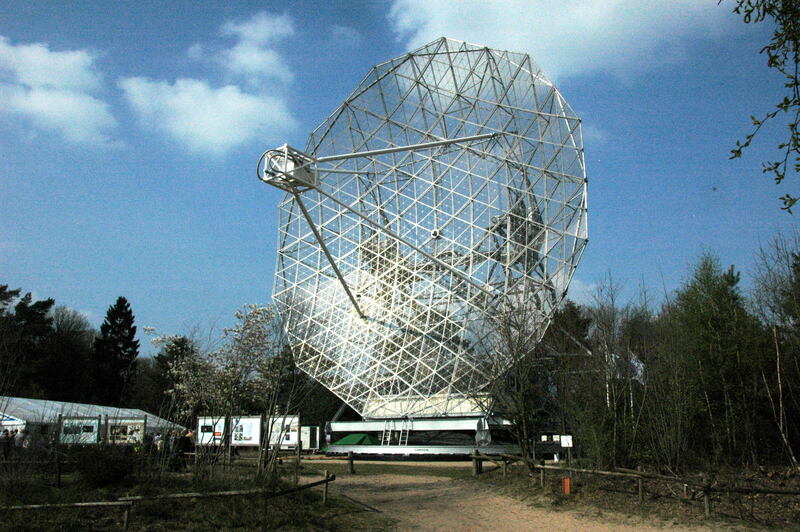 Antenna tracking with dish of a mass of 120 tons. This entry was posted in Satellite Bounce, WSJT and tagged 1296 MHz, 23 cm, Dwingeloo, JT9H, Mainz, OKEAN O, PA3FXB, PI9CAM, Radiotelescope, Satellite Bounce, WSJT-X on 2015-12-08 by admin. 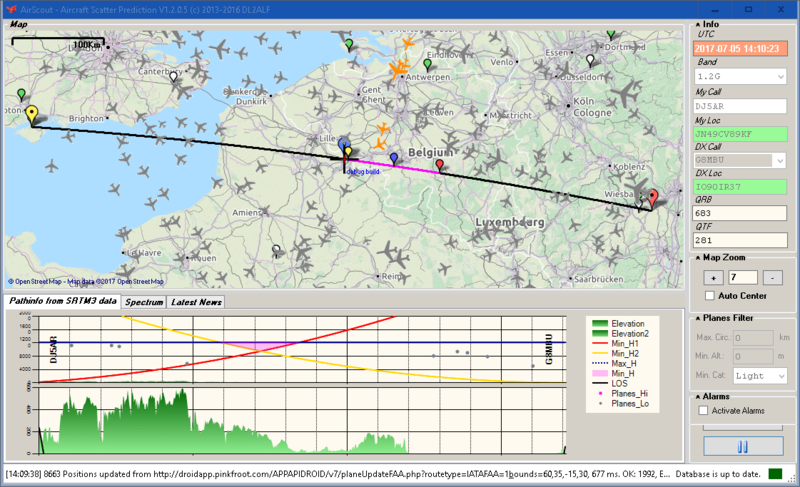 Following Jan´s (PA3FXB) suggestion, we tried the new experimental WSJT-X software. The mode, we chose was JT9 H. Also we agreed in trying full doppler compensation to be used on my side. Everything worked fine, as can be seen in the screenshot below. This entry was posted in ISS, ISS Bounce, WSJT and tagged 1296 MHz, 23 cm, Doppler, International Space Station, ISS bounce, PA3FXB on 2015-09-13 by admin. 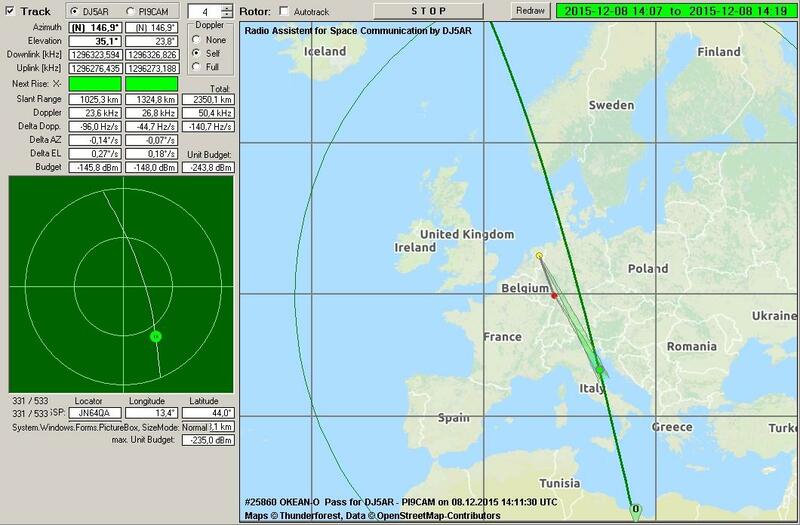 Back from our holidays Jan, PA3FXB, and I had another test via ISS Bounce on 23 cm today. As I located a bug in my Doppler correction software, causing unwanted steps, it could be fixed by finding a workaround for the malfunction in compilers NOW() routine, for returning the correct time in milliseconds. So the improved Doppler correction is working smoothly as can be seen and heard in the signals received. 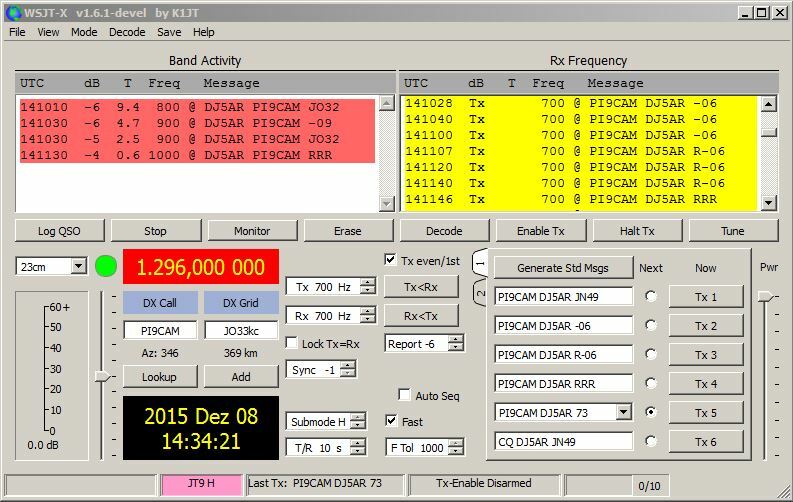 PA3FXB in JTMS received by DJ5AR via ISS Bounce. Center frequency was 1296.300 MHz. As further tests showed, the full doppler correction on my side is working very well now. This enables potential sked partners to work on a fixed frequency by just tracking the International Space Station with the antenna. This entry was posted in ISS, ISS Bounce, WSJT and tagged 1296 MHz, 23 cm, Doppler, International Space Station, ISS bounce, JTMS, PA3FXB on 2015-09-05 by admin. On April 7th the PI9CAM team hosted some students, working on a film project. So there was some spare time to schedule more tests in our space debris project. The objects, selected to try on, were some rocket bodies. Many of the larger objects in low earth orbits are of this type. The operation style, as usual, was a center frequency of 1,296.300 MHz, 15 seconds periods with DJ5AR transmitting first. This time we wanted to try FSK441 mode, to compare it with the experiences, we had with ISCAT-B. On two objects, NORAD #39679 (SL-4 R/B) and #39771 (H-2A R/B) we registered faint but continuous reflections. Only partial decodes were possible. It seems, that ISCAT-B is the better choice. On SL-4, a russian rocket body, lauched on April 16th, 2014, a modulation of the reflections with a period of 2.8 seconds could be observed. It looks like, as the object is tumbling. TNX to Jan, PA3FXB and the CAMRAS team! This entry was posted in Satellite Bounce, WSJT and tagged 1296 MHz, 23 cm, DJ5AR, Dwingeloo, FSK441, PI9CAM, Rocket Bodies, SAT Bounce, SHF, Space Debris on 2015-04-08 by admin. January 15th, 2015 On February 21st, 2015 Jan, PA3FXB, and I will give a lecture in Dorsten at the GHz convention. It will be held in german and partly in english and is basing on the former lectures “Let´s Bounce”. We will talk about unusual use of Aircraft Scatter and our experiences using ISCAT. Two years ago the idea, to try ISS Bounce, was born and discussed in Dorsten. We will show what we have done in the meantime in practising this propagation mode. This entry was posted in Aircraft Scatter, Lecture, Satellite Bounce, WSJT and tagged 1296 MHz, 23 cm, Aircraft scatter, Dorsten, GHz-Tagung, ISS bounce, Let´s Bounce on 2015-01-15 by admin. Jan, PA3FXB, and I skeduled a very special ISCAT test on 23 cm for today. The CAMRAS team had planned to operate PI9CAM with the 25 m radiotelescope in Dwingeloo for some astronomical experiments this afternoon. Before starting with that, we used an ISS pass with low elevation to try ISS bounce with the big dish. Such a pass ensures slow variation of azimuth end elevation angles, which is essential to track moving object like the ISS (or other spacecrafts in low orbits) with an antenna of a weight of 120 tons. We had very strong reflections right from the beginning, but no decodes. Maybe the signal level was to high? This has to be investigated. Then we changed to aircraft scatter, although the dish had to be kept elevated at 10° by safety reasons, I got strong reflections from airplanes quite close to PI9CAM. Not as strong as from the ISS, but decodable now and it was possible to work in CW too. Despite the fact, we had no QSO via ISS bounce, we learnt, that it is possible to track objects in low orbits with the 25 m radiotelescope, as long as the elevation keeps low. This opens up a perspective to make use of other spacecrafts as reflectors. This entry was posted in Aircraft Scatter, ISS, ISS Bounce, Satellite Bounce, WSJT and tagged 1296 MHz, 23 cm, Aircraft scatter, ISCAT, ISS bounce, PA3FXB, PI9CAM, Radiotelescope on 2015-01-06 by admin.